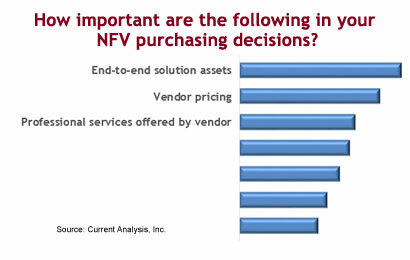 Specifically, I was thinking about the implications of best-of-breed SDN/NFV ecosystems vis-à-vis some recent carrier survey feedback that we collected. Specifically, our survey indicated a near-term preference for doing business with vendors that can claim a complete portfolio of products and related services, but also acknowledged the importance of solution pricing in their buying decisions. So then, how to reconcile the ideas of best-of-breed vs. end-to-end and then layer pricing on top. On one hand, we have the (entirely logical) claims of vendors such as Alcatel-Lucent, NSN and many others to be putting together a best-of-breed ecosystem of SDN/NFV suppliers. Doing so both acknowledges limitations in their own portfolios and speaks to the fundamental value of SDN/NFV being ideally suited to enable multi-vendor networking based on open sourced code and commodity hardware. Next, we have vendors such as Cisco, Huawei and others that, while messaging their support of openness, are undeniably approaching SDN/NFV from the perspective of being a comprehensive supplier. And then, of course, regardless of which route a vendor takes, carriers seem to be saying that whatever’s being delivered, they want it cheap. Here is where I can see tension between partnership and pricing considerations becoming an issue for the best-of-breeders. A company with a larger quiver of capabilities can approach a deal from a holistic perspective. In doing so, they can bake potentially complex pricing considerations into a proposal. An ecosystem featuring a number of players that all need to meet their own financial objectives in any given deal, however, is going to be somewhat less flexible in playing the proverbial shell game with respect to where money from a deal gets allocated. So, does this confer a natural advantage for end-to-end suppliers, at least in the early days of SDN/NFV? Cricket Wireless’s SDN Trial with NEC and NetCracker might indicate that synergies (if not outright common ownership) in an SDN/NFV go-to-market are an asset. On the other hand, AT&T’s Domain 2.0 announcement, which included Tail-f, Affirmed Networks, Metaswitch, and Ericsson, would indicate that openness and the ability to participate in a best-of-breed model is really a key mandate. Admittedly, these are only two examples, and many more will be stepping into the light of day soon enough to give us a bigger sample size. In the meantime, my sense is that, beyond the largest of the large, many operators are looking to keep things as simple as possible in these early days of carrier SDN and NFV: simple from a technology decision perspective, simple from a vendor management perspective, simple from a pricing perspective. To this end, a broad product line will be important, but perhaps even more so, professional services capabilities will be a potentially huge differentiator. If a vendor, even without the soup-to-nuts SDN/NFV product offering, can simplify an operator’s life by managing the complexity associated with adopting virtualization, then I think that vendor is going to win business. Call it my own stab at an MWC15 spoiler alert. Next postNetwork vs. IT: The Right Way to Look at Things?